Skip has served St. John’s Church as a voluntary assistant for since 1989. 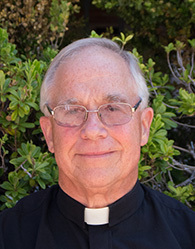 His ministry at St. John’s has included clown worship, adult forums on bible study, trainings for Stephen’s Ministry, workshops for parish retreats along with Sunday services and supply work in the Diocese of California. Skip retired as the Associate Dean of Student Activities at City College of San Francisco. He worked with student government, taught student leadership classes and worked with eight campus student councils. He worked with community colleges for over 31 years, as a chaplain and administrator. He has been an instructor and retreat leader in clown ministry nationally. He served as a board member of The Episcopal Society for Ministry in Higher Education for three years. He was the advisor to the State Student Senate of California Community Colleges for two years and served as an officer and board member of the California Community Colleges Student Affairs Association for six years. He is a graduate of General Theological Seminary and has held positions of Assistant to the Rector at St. James Church, Batavia, New York, served as Priest-In- Charge of St. Paul’s Church, Stafford, New York, Chaplain at Genesee Community College, New York; Rector of St. Mark’s Church, Moscow, Pennsylvania; Chaplain at Manatee Community College, Bradenton, Florida; Director of Student Affairs at the College of Marin.